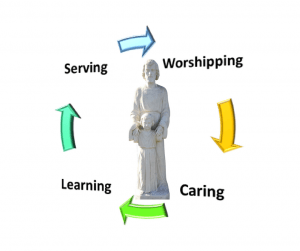 St. Joseph Parish launched a planning process in the Summer of 2017 with the parish council and other parish leaders to develop a well-researched plan that will result in a fresh and vital approach to practicing our faith for the community of Austintown. All parishioners will be kept up to date on the work of the team and will also be invited to participate in a variety of ways during the planning process. Your voice will be heard. Please note that this is not a plan to merge St. Joseph Parish with Immaculate Heart of Mary Parish. The focus is the revitalization and growth of St. Joseph Parish. Check back to this website page. Jim Merhaut of Coaching to Connect is facilitating the process. The team has been interviewing leaders in Austintown to discover the strengths of our community and the challenges we face. We are learning much and are sifting through the data from our interviews seeking to hear how God is calling us to do ministry in Austintown in partnership with others. There were a couple of responses to the survey that the team felt were actionable even before the planning process was concluded. The first was a simple educational series that Fr. Fedor could offer before Mass each Sunday to help parishioners understand the various parts of the Mass as a means to enhance their participation. The team also arranged to have the series recorded and posted on the parish website. CLICK HERE to view the recordings. We are promoting the recordings on the parish Facebook page, and they are consistently getting the top or second-most number of hits per month. The second project being launched in response to the parishioner survey is the Caring Neighbors Project. 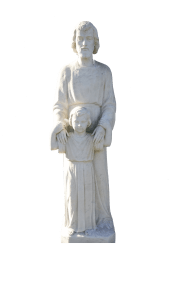 Still in its early stages as of December 2018, the Caring Neighbors Project will encourage parishioners to reach out to each other in their neighborhoods in caring ways. After reviewing the survey results, the team discerned the need to learn more about two ministry areas in the survey that were clear priorities: 1. Music Ministry, 2. Welcoming Young Families at Mass. The team organized and conducted a focus group for each ministry area and is in the process of developing action steps for each ministry area. The parish-wide survey was prepared January-February and released March-April. To make the survey statistically reliable, we needed 60-80 completed surveys. We are pleased to report that 166 parishioners of all ages took the survey. This was a very strong response! Thank you to those who participated. Click the link below to view and/or download the summary report of survey results. A caring community: Members express love by caring for and about each other. Not only do we take care of each other, but in an authentic church, members also genuinely grieve the loss of another member. A learning community: The church and its individual members are lifelong learners. We never fully grasp the mysteries of faith. Adult learning is central to thriving churches. Learning for teens and children thrive only in the context of an adult learning community. A serving community: Vibrant churches serve the neighborhood surrounding the church building. Vibrant churches also serve the people who are in greatest need in the region and nation. Vibrant churches also reach out to other nations in times of need. Not only do we offer our service, but we also work to change the social and political conditions that lead to poverty and other forms of injustice. A worshipping community: The most defining characteristic of a church is it’s relationship to the great mystery that we call God. Through our Sunday Eucharist and all of the sacraments, Catholics experience and express the presence of God in the world and unleash the power of God acting in and through all of creation. All four of these characteristics are dependent upon each other. If one is strengthened, they are all strengthened. If one is weakened, they are all weakened. If one dies, the church is no longer a church. CLICK HERE to download a poster version of The 4 Essential Characteristics of a Church. God often speaks to us through our relationships with others. God speaks through our bodies, our minds, and our emotions. When God speaks, the message is consistent with what we know from God’s law (Scripture and Tradition). We have a deep sense of peace even if the message is challenging. What we hear does not lead us to a selfish response. We test what we hear in community. Church ministry teams are called together to advance the mission of the parish in a particular way. The work they do is important, but the way that they do it is equally important. Church members are called to be friends. We are called to treat each other respectfully when we meet together, but what does respect look like on a church team? The St. Joseph Planning Team has developed a covenant for itself that establishes the rules for engagement as they do their work. The team believes that their covenant document describes what respect looks like on a church ministry team. They believe that this document could have value for other groups in the parish as well as groups beyond the parish. CLICK HERE to view and/or download the covenant document. We encourage you to use it with your church team, or develop one of your own with your team. You may also find it helpful to discuss parts or all of the covenant with your family or at your workplace. It has the power to inspire productive discussions that could lead to improved relationships and better decision-making.